The basic motivation: to end or radically reduce the math poverty around the globe 10-20+ time faster than normally possible. The main focus is on the developing and under-developed countries, but we are willing to work with the developed countries if the governments are willing. & to end the math poverty means the financial poverty itself. Developed English-speaking countries ~ 15-35%. The series of USL (which made the average students learn 30-40 days of normal class math in 1 class of 30-40 minutes) originally, then MMU1 (Mini Mini USL1 which boost the math worst half to the math best half very quickly) were created by Lee and were designed to empower the mind (especially math) of the people so that we can overcome the global crises much faster and easier than traditionally even imagined to be possible. NOTE: For each of the assertions or claims below, please click to see the source pages that may enhance your understandings. 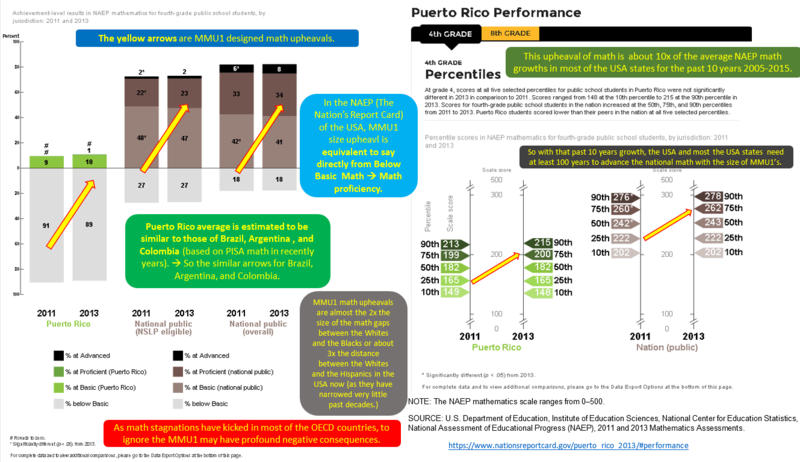 A rough rule of thumb essence of MMU1 to the developed OECD countries, USA and the Latin American countries is summarized here in this chart based on the USA average vs. that of Puerto Rico. Follow the yellow arrows that symbolize the growth size due to MMU. To view clearer, please click on the image. the math proficiency (be it for NAEP, TIMSS, or PISA) of the non-Asian or Latin American western OECD nations is not going to be 10-30% any more but 60% (which is the best math USA state or big cities at least for the grade 4) ~ 80% (far beyond the current top 5-6 Eastern Asian math nations). the math proficiency (be it for TIMSS, or PISA) of the Latin American above the average countries – 1) Latin American top tier (Chile, Uruguay, Mexico, Costa Rica, and Trinidad & Tobago) or 2) Latin American mid tier (Brazil, Argentina, Colombia, Ecuador) – exceed the current USA average (for the LAC top tier) or will rise close to or higher than the USA average after MMU1 shakeup. For the 80% level is higher than the best math nation (e.g. currently the 4 Asian Tiger countries’ estimated average). So to acknowledge its profound potential and grow together or to ignore to stagnate for decades are your choices, be it rational or fear-bound. The link above about Lee gives the other composite links to guide you through. Lee has run pilot studies of the original USL (during which he made the average students of the grades 2-11 to learn 30-40 days worthy of math in 1 class of 30-40 minutes, but this was too much for normal people in EDU establishments and backfired). So he backpedalled then and ran the initial MMU1 pilots (to boost the math 25 percentile rapidly to 75 percentile), published a series of papers on the math stagnations as real (which Lee believes that all the Ministries and Departments should wake up and pay attention, but in reality they seem to be ignoring this systematically), released ongoing economic justifications about absolutely urgent necessity of MMU1 for most governments, and finally he is trying to run MMU1 pilots in the developed countries, be it districts, cities, states, or countries. To propose MMU1 pilot study proposals to the districts, cities, governments, philanthropists, NGOs, investors, media people, and other like-minded people (summarized in this 1 page highglight, although written for the USA, basically almost the same rule applies to the entire developed countries that speak English, German, Spanish or French) who are rational, efficient to go directly to the ultimate causes of troubles instead of whining and complaining, praying with the never ending wishful thinking that haven’t bear fruits and will not bear fruits.